Camera – Picture quality is very good, can shoot in 4K, fast and responsive. Display – Image quality is crisp and clear. Can be easily seen in direct sunlight. Storage – Enough Internal storage for all photos & video and also support MicroSD card up to 2TB. Battery Life – I’ll have no problem going full day with the good amount of use. Also, fast charging is useful. Bloatware – The ZenUI is bloated with unnecessary apps. Capacitive keys – No backlight in capacitive keys, almost impossible to guess whether bottom part holds any buttons. 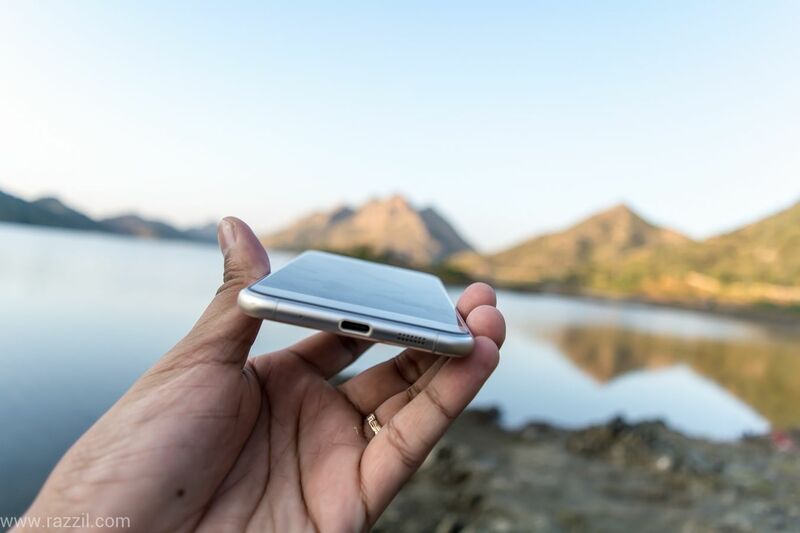 Glass back – The Glass on the rear part of the phone make it slippery, dust & fingerprint magnet. Also vulnerable to crack when phone fall. The Zenfone 3 box consist a Zenfone 3, standard charger, USB Type-C cable and earphone. 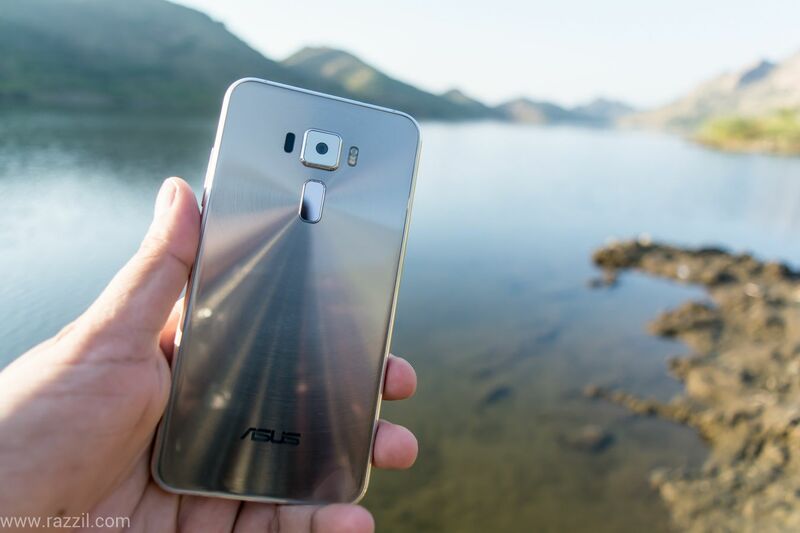 From the design perspective, Asus finally revamped the design of Zenfone 3. Now it won’t look like old Zenfone series. The phone is using metal all over with round edges and put the 2.5D Corning Gorilla Glass on both sides. 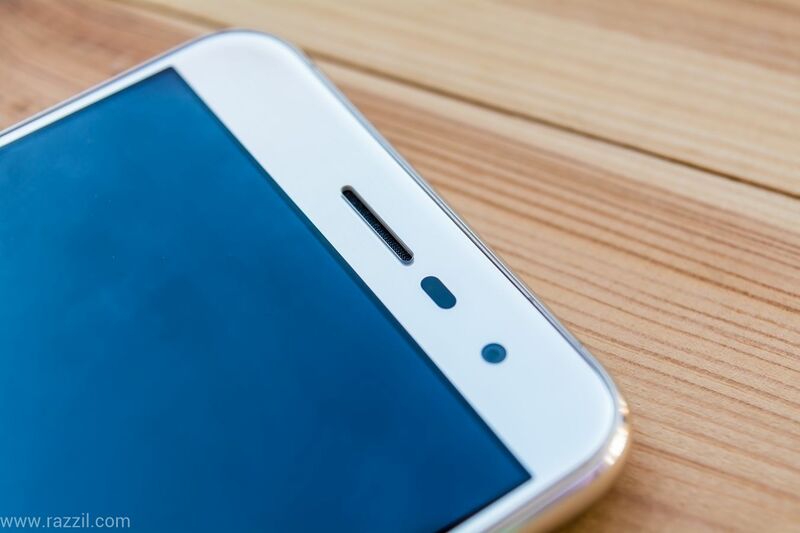 The combination of Metal, Glass and round edges looks beautiful but at the same time, it makes the phone slippery. No matter how you hold the phone, it always slips out of your hand. The volume and power button is on right-hand side and it slightly raised from the body for easy access. On the back, you’ll find a rear camera with dual flash and fingerprint center at the top center. The fingerprint placement is good and you won’t find any difficulties to reach the reader. The scanner shape is a bit awkward as compared to another phone. You’ll have no problem in accessing the scanner but I doubt it’ll create a problem when you put the case on. I used the phone without the case and I never faced any problem with fingerprint scanner., works almost every time. The phone has very slim metal frame of around 6.16 mm and 2.1 mm slim bezel with 77.3% screen to body ratio. 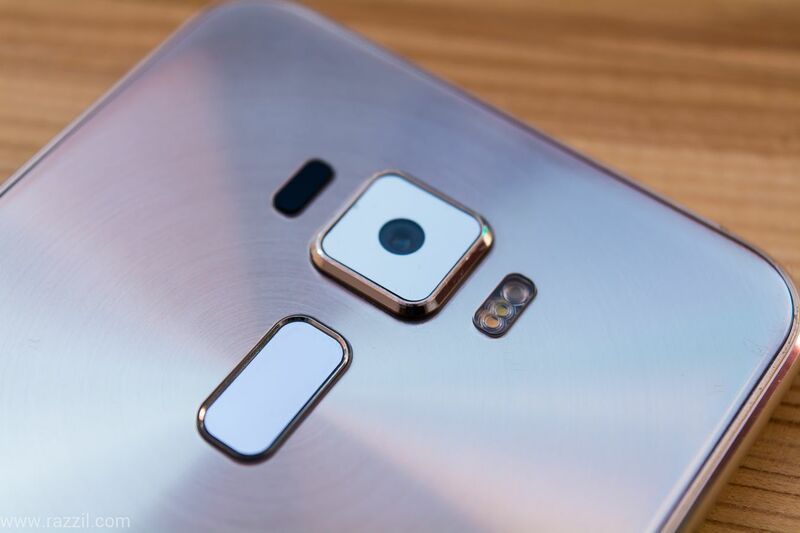 The speaker & USB Type-C port is at the bottom of the phone. The Asus Zenfone 3 comes with Android 6.0 Marshmallow with ZenUI 3.0 on top. When you start the phone for the first time, you’ll greeted with beautiful homescreen with material color all over it. When you turn on the Wi-Fi, the first thing phone will do is to automatically start downloading some third party apps like Tripadvisor etc. The phone is already pre-loaded with bloatware, the apps which you never used in your lifetime or not require but still Asus package the with every phone. I never seen that amount of bloatware apps in any android device. Asus Zenfone 3 top the list with highest amount of bloatware apps which make it biggest cons of this phone. Through the Asus did good work with software optimization. During my testing, the phone never lag or heated up in a day to day tasks. Through the phone heat up when you play the game but that’s the normal behavior. Asus Zenfone 3 is powered by 64-bit, 2 GHz Octa-core Snapdragon 625 processor which is mated with Adreno 506 GPU and 4GB of RAM. The overall hardware package provides good performance for users who do the normal users and if you’re power user then may be slightly disappointed. Asus can take out more power from his hardware. Comparing it with OnePlus 3, the performance of Zenfone 3 is adequate. The phone comes with 64 GB storage which can further increase to 2TB as long as you don’t want to use the second SIM. It comes with hybrid Dual SIM Slot. Either you can second SIM or use microSD card. Asus Zenfone 3 loaded with 16MP camera with the Sony IMX298 sensor, 6-element Largan lens, f/2.0 aperture and TriTech auto-focus. The rear camera setup is protected by the sapphire glass. The rear camera has both OIS and EIS for blur-free shots and video. 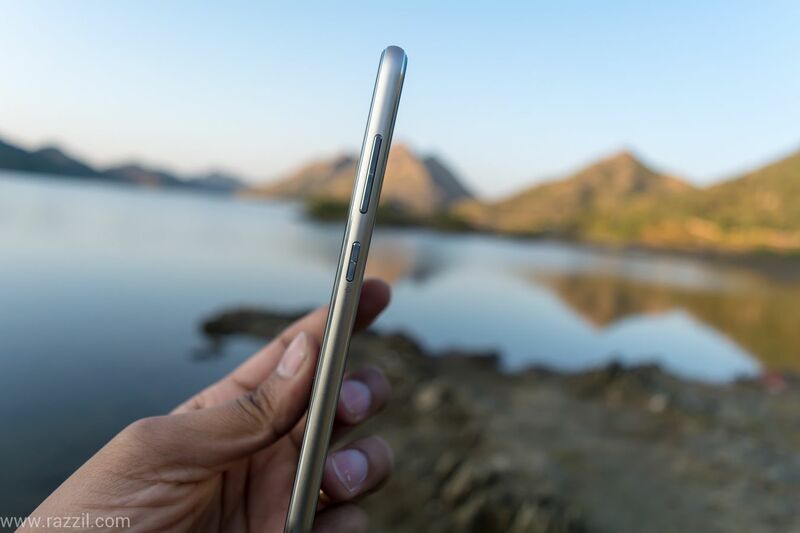 The Zenfone 3 is using TriTech auto-focus technology which combined laser, phase detection and continuous auto-focus. The focus works really good in daylight however in low light, I struggle to focus on my subject. During daytime, the Zenfone 3 camera perform really good. It’s really fast from opening to the capturing photo. The overall picture quality is quite good. The pictures are sharp and produce vibrant colors. The color correction sensor detects the type of light and automatically applies the best settings to achieve the perfect balance for natural looking colors. During my testing, I always put the camera on HDR Auto mode. The HDR just dramatically improve every photo it takes, it’s bit slow as compared to Auto mode but I still prefer it to have it ON. For more advanced HDR pics, the camera also has HDR Pro mode. Auto: In this mode, the camera automatically senses the require aperture, shutter speed, ISO & Exposure. This is the default mode. Manual: In this mode, you can tweak the camera settings to achieve desired effects. This is Advance mode and must require photography knowledge. HDR Pro: mode shows exactly how photos and videos look before you’ve even pressed the shutter! Beautification: This mode will smoothen human skins. Good for portrait or group portrait. Super Resolution: This mode takes multiple photo & compress it to create High-Quality photos. Low Light: This mode optimizes the camera settings to show in low light conditions. Night: This mode is useful to take photos in Night. Depth of Field: This mode allows you to blur the background while maintaining the focus on the subject. You need a tripod to gets the best result. Effects: In this mode, you’ll get many filters options just like Instagram. Selfie: This option switches the camera to front camera. GIF Animation: This mode allows you to create animated GIF. Panorama: This mode allows you take photos into a big panoramic mode. Smart Remove: This mode takes photos into burst mode and allows the user to edit the photos to remove unidentified objects. Slow Motion: Allow you to shoot video in slow motion. The ZenFone 3 can shoots video at 4K UHD resolution, the Asus is using High Efficiency Video Coding (HEVC) to keep the 4K video file size to a minimum without sacrificing the quality. In low light, the phone struggle to capture good images, it struggles in focus and also the night pictures shows the grain in the final shot. The front camera comes with 8MP resolution and capture decent selfies during both day & low light photos. The Asus ZenFone 3 is powered by 3000 mAh battery. The Hardware & Software optimization is so good that it takes you to the end of the day with moderate to heavy use. 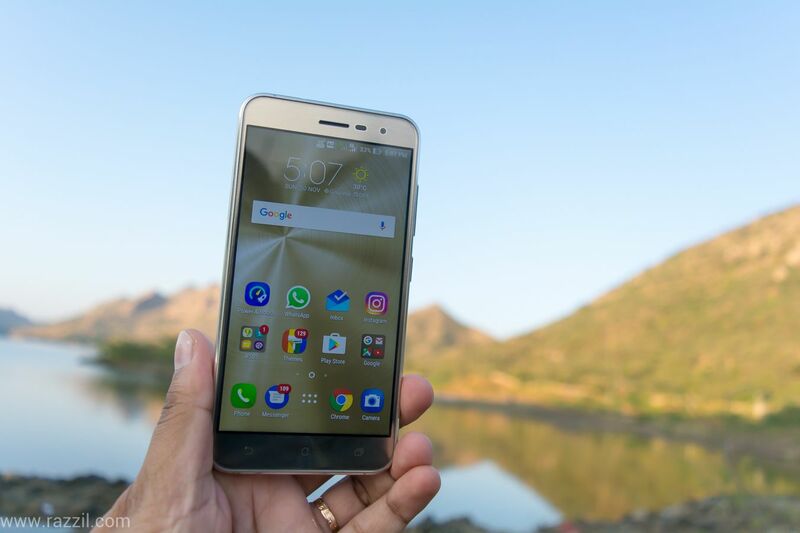 The Asus Zenfone 3 is an overall excellent mid-range device under ₹ 30K. The phone carry superb build with an excellent camera. The phone is a good alternative to OnePlus 3 and if you’re happy with bloatware and glass back panel then this phone is for you. The Asus Zenfone 3 is an overall excellent mid-range device under ₹ 30K. The phone carry superb build with an excellent camera. The phone is a good alternative to OnePlus 3 and if you're happy with bloatware and glass back panel then this phone is for you.